Will You be Ready Offshore When Rough Weather Hits? You're ready to head offshore, but are you ready for rough weather? Mother nature can create some unique challenges and having the right sails and crew can make all the difference. Follow these tips for preparing your boat and your crew, and let the adventure begin! While “cruising” and “rough weather” seem to be contradictory terms, even with modern weather forecasting, it is a reality of offshore sailing. 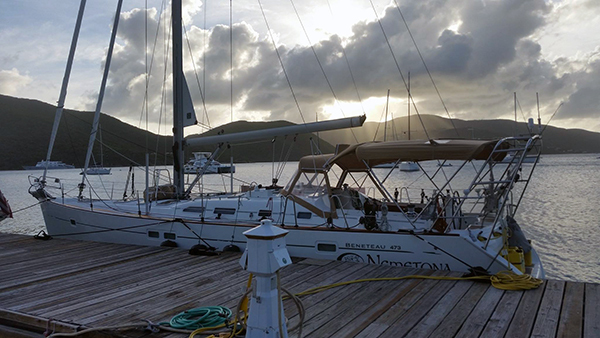 Quantum sail designer and pro sailor David Armitage found that out first hand while delivering his Beneteau 47 Nemetona as part of the Salty Dawg Rally from Norfolk, VA, to Virgin Gorda for the start of a nine-month sailing adventure with his family. Dave completed the passage with the help of his father and brother, both experienced sailors. Their departure date was set on a recommendation from Chris Parker of the Marine Weather Center. Indeed, there were a number of boats that would head out at the same time on Parker’s advice. While they had a decent weather window, they could still expect to see some heavy weather and rough seas during the 1,300 nm journey. The sail inventory required for any offshore sailing experience is very different than what one needs for in-shore or even weekend coastal cruising. Outfitting your boat and preparing your crew properly is like taking out an insurance policy: Hopefully you won’t ever need it, but you will be very happy to have it if you do. More sail area doesn’t always mean more speed, certainly in rough seas and big breeze when the boat can easily be put on its side. The autopilot does a lot of work offshore, but for the autopilot to work well, both the sail area and the trim must be balanced. With a small staysail and reefed mainsail, Dave and his crew were able to maintain up to eight knots on their course in 35 to 40 knots of breeze. “If you saw the boat during these periods, you would have been shocked at how little sail area we were carrying, and yet still making good forward progress,” he says. When you’re out at sea and it’s blowing 30 knots, your primary all-purpose genoa on the roller-furler isn’t going to cut it; the sail will be too big when it gets rough, and you won’t be able to furl enough sail for the conditions and still have a working headsail. Having a heavy working jib not larger than 100% of the perpendicular distance from the luff to the clew as well as a true storm jib or staysail is crucial. The working jib can be flown on an inner forestay, if you’ve equipped your boat with one, or on the primary roller furling system. However, if you have to drop the genoa and hoist the working jib, you’ll want to be very prudent about performing that maneuver early and not waiting until the boat becomes unmanageable in the building breeze. Additionally, having a purpose-built small jib will extend the life of your genoa. When it really gets rough, you need to have a true storm jib. There are multiple ways to fly a storm jib, and if you have a furling system, you’ll need a sail with piston hanks for the inner forestay. Other considerations like a tack pennant or pad eye for sheeting should also be discussed with your sail maker. Read more about choosing cruising headsails. If using a traditional mainsail, you need to be sure that you have the right number of reefing points and at the right distance, and that you know how to use them. Flynn recommends two deep reefs. During sudden squalls, the mainsail will most likely be dropped completely. For upwind sailing in sustained high wind, you will need a storm trysail. To use the storm trysail, you would normally take the mainsail off the boom and stow it down below. If your boat is equipped with an in-mast furling system, you probably don’t need a storm trysail. The in-mast furling allows you to roll up the main in such away that is very flat and about the same shape of a storm trysail. While there are a number of pros and cons to an in-mast system, the ability of being able to reduce mainsail area in a hurry could be huge. “In these instances [we were able to] reduce sail quickly in the rainsqualls, which allowed us to maintain control and balance,” says Dave. Read more about choosing the right mainsail for your boat. Nematona was making good progress down the coast, but some of the other boats tacked to the northeast and headed out to sea to avoid the rough weather. The result was an easier ride, but they ended up sailing up to 200 extra miles in the wrong direction. The boats that took that route arrived two days behind Nematona. If he had to do it all over again, Dave says he would have taken the same route, but he would have rather had four people on board. Their watch system in rough weather consisted of one person at the wheel, the second person resting under the dodger just aft of the companion way, and the third person was down below attempting to sleep. During the last three days, actually getting any quality rest was almost impossible in this scheme. You can follow Dave and his family’s adventure on their blog and Facebook page.